In a nutshell: Tavares Beach is a medium sized crescent shaped sandy white beach with easy access and ample parking. Minuses: Crowded on weekends and holidays. Some rocks in water. Occasionally swells bring massive influx of seaweed. Tavares beach is practically unknown except among locals. 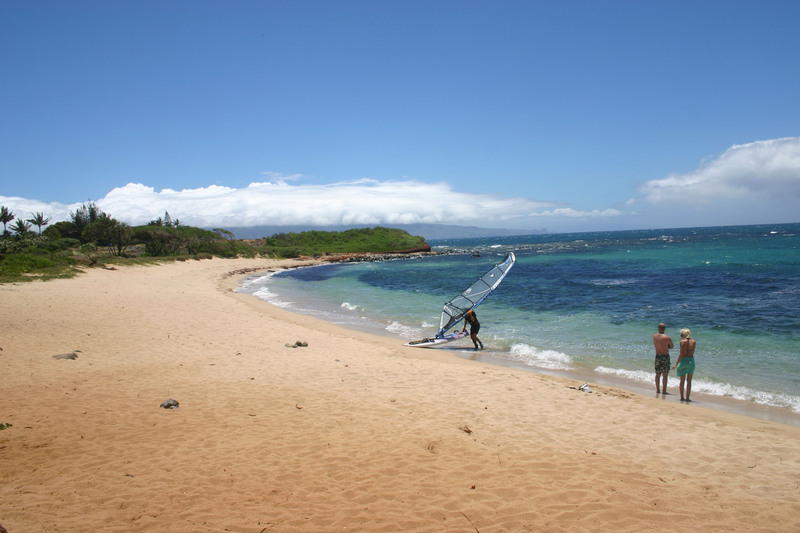 Tavares Beach is a medium sized crescent shaped sandy white beach in the area adjacent to Paia known as Kuau. Easy access and ample parking. Good for swimming, snorkeling, spear fishing, rock jumping, surfing and windsurfing. Off the radar for tourists, it is usually uncrowded during the week. Tavares is a favorite among locals so weekends and holidays are crowded – best to go during the week. Even though it is located right next to the road, if you were to blink, you’d miss it. 1/2 mile past the Paia traffic light, Tavares Beach is unmarked (besides a generic “Beach Access” sign in the vicinity.) Not listed in most guidebooks, most visitors pass by Tavares unnoticed. The beach is frequently called “Blue Tile House Beach” by newcomers – this name is convenient for those not familiar with the area as there is a landmark beach house right next to the parking lot which sports a stand-out glazed ceramic blue tile roof. On the beach, you’ll notice there is a reef here close to shore, which keeps the break minimal at the shoreline. There is also a nice surf break further out that can provide anywhere from beginner to advanced surfing and windsurfing depending on the swell. (Note: all North Shore breaks can get extreme in the winter.) This beach also features a rocky outcropping to the right (east) side of the beach that was perfectly situated for jumping over a deeper, wave protected area – however, as of winter 2011 this area has filled in with rock fallen from above, and is now much shallower. There can be a lot of seaweed at certain times of the year, and there are different amounts of exposed boulders in the water at different times of year. Neither are a big deal if you pay attention. Location: Hana Hwy (Hwy 36), 1/2 Mile Past Paia. Beware!!! This is a good beach and we saw lots of turtles and most of the folks were nice….but…as I was standing in the sand some young surfer duded came to look at the break…I didn’t think anything of it..they returned with their boards and went into the water. When I turned to put my flips back on they were gone! One of the young men had simply slipped his feet into my flip flops and walked back to the car with them. Losing a pair of slippers was no big deal (even though they were $50 flips ) but I got the feeling that if they would steal flip flops they would steal anything if given the chance. If you go to Tavares beach beware…and watch your flip flops. During a full moon, this is a great spot to watch big turtles come up outta the water to avoid the sharks. Come sunrise they head back out to sea. On two different years during vacation we drove into this parking lot. There were only 2 or 3 cars there–and locals that stared us down with unfriendly looks. We left. I’m not saying the residents surrounding it, but those accompanying the few cars there. Perhaps it is different on other days than the two we happened to choose. Most of the time the locals have been wonderful. Those in this parking lot gave us a “go away” vibe. Found this beautiful beach by accident! Once found, never to be forgotten. 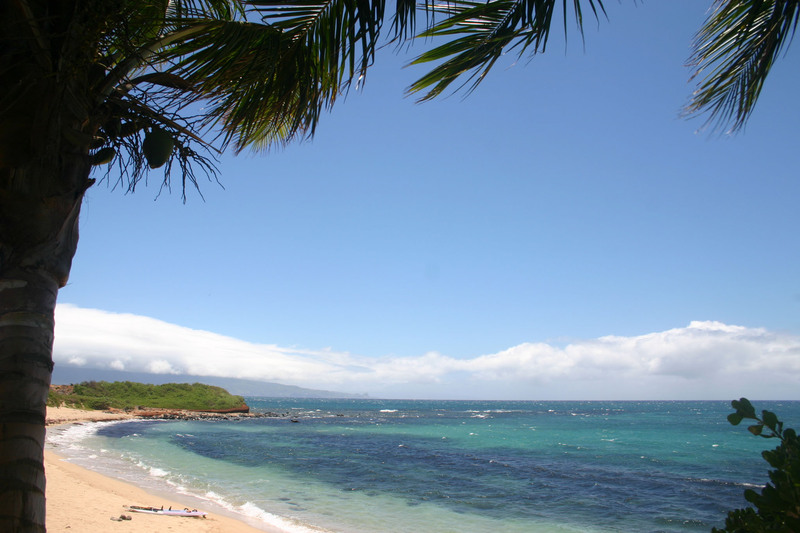 We returned several times over the three weeks in Maui and each time was better than before. We had the place to ourselves most times, with the exception of visits from turtles. They came up on the beach three times, to bask in the hot sun. What a thrill! Paradise found.